Module 1: An Unbridgeable Chasm? The population of the State of Israel, founded in 1948, initially refuses any contact with Germany and the Germans. Hundreds of thousands of Israel’s inhabitants saved themselves by fleeing Germany and Europe for the British Mandate of Palestine; the pain and loss suffered is unimaginable, and its traumatic consequences for the survivors cannot be “confronted” or “atoned for”. The start of official relations between Germany and Israel is one of open rejection. Even as the survivors of the Shoah dwindle and growing numbers of young Israelis are fascinated by Germany, even if the National Socialist period no longer plays a central role in the attitude held by Germans toward Israel today: The past is ever-present in German-Israeli relations. Office of the Israeli President Zalman Shazar, August 19,1965. 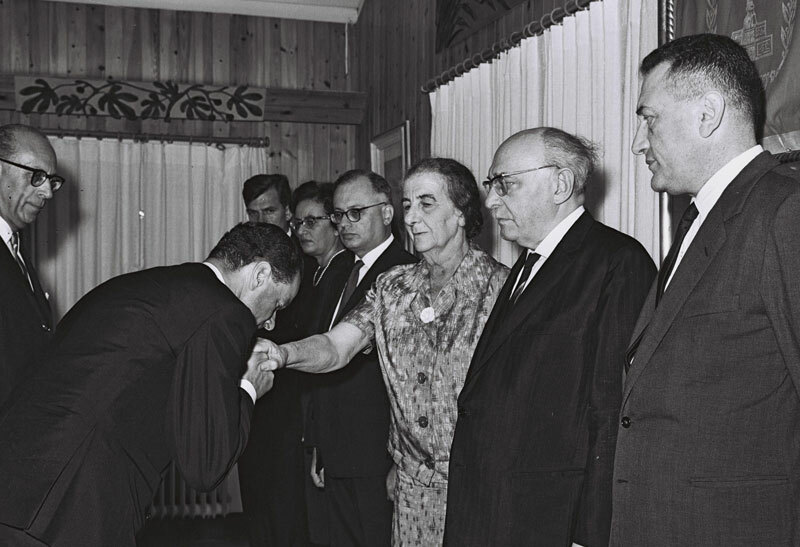 Reception for the German Ambassador Rolf Pauls, who holds his inaugural address in German, and then – entirely misjudging local customs – kisses Foreign Minister Golda Meir on the hand. At the end of the 1950s, Israel is largely isolated in the Middle East; allies are few and far between. As a result, a desire grows in Israeli government circles to consolidate international ties outside of the Arab world – and even establish diplomatic relations with the “new Germany”, which is reliably fulfilling the terms of its reparations agreement. Prime Minister David Ben-Gurion requests that the Federal German government establish “normal diplomatic relations” with Israel. This proves challenging: In the event that diplomatic relations with Israel are established, Arab states threaten to freeze their positive relations with West Germany and recognize the GDR under international law. Bonn and Jerusalem therefore enter into secret negotiations regarding military collaboration. In the same year, Federal Minister of Defense Franz Josef Strauß and State Secretary Shimon Peres arrange the first weapons shipments (“tanks over diplomats”). 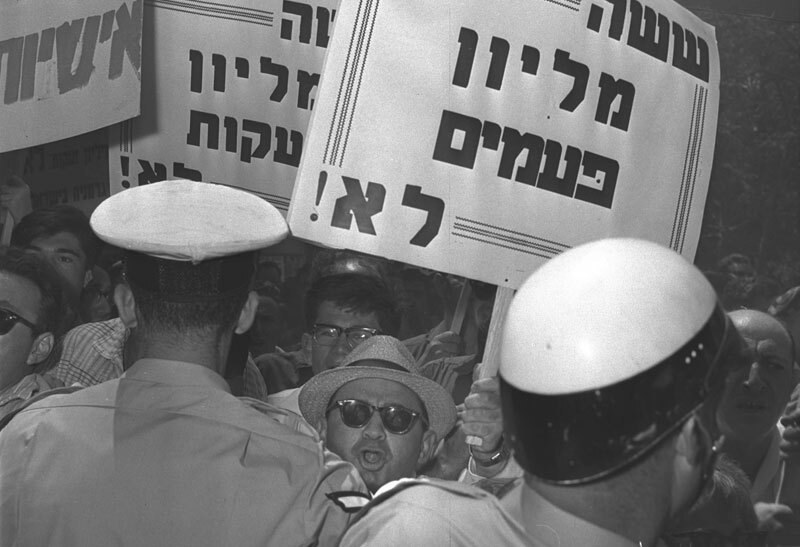 When Ben-Gurion and Adenauer first meet in New York in 1960, the Federal German Chancellor once again turns down Israel’s request for diplomatic relations. However, the politicians hold confidential talks on the continuation of German weapons shipments worth over 200 million DM; just as discrete is Adenauer’s offer of a ten-year, 50-million-dollar loan. 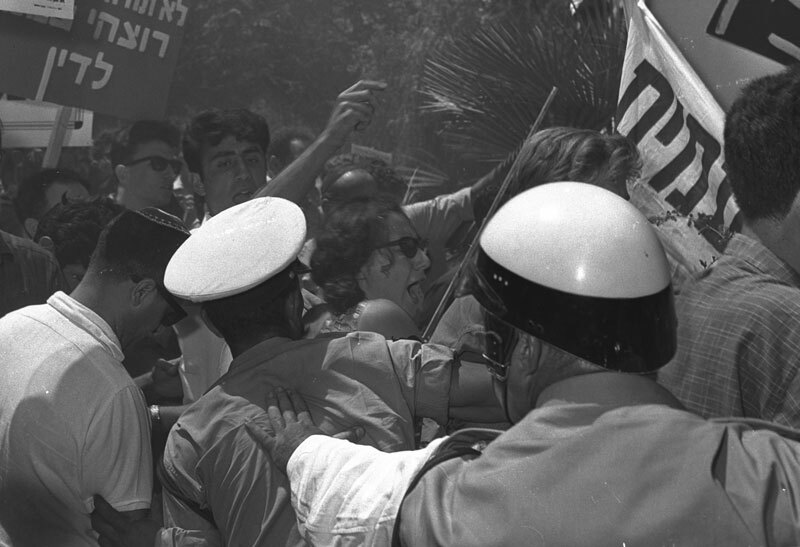 The fact that the Bonn government appears to be giving in to blackmail from the Arab states becomes too much for portions of the West German population to accept: October 1964 sees the German Confederation of Trade Unions begin a petition for the establishment of diplomatic relations with Israel. When, soon later, German weapons shipments are uncovered by journalists, other civil initiatives are enraged at what they see as unworthy compensation for the diplomatic disregard shown to the Jewish State. Egypt’s State President Gamal Abdel Nasser also reacts to Germany’s military support of Israel by receiving GDR Head of State Walter Ulbricht for an official visit in February 1965. By now, West Germany’s claim to an exclusive mandate as the sole legitimate representative of the German people is no longer tenable – and nothing stands in the way of diplomatic “normalization”. On May 12, 1965, Federal Chancellor Ludwig Erhard and Prime Minister Levi Eshkol agree to exchange ambassadors. Ten of the thirteen Arab states temporarily suspend diplomatic relations with the German Federal Republic, but do not yet dare to recognize the GDR. 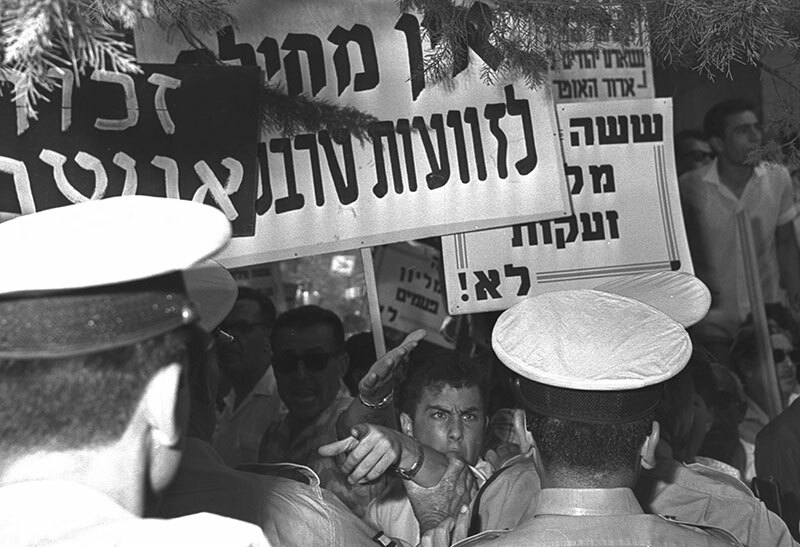 Rolf Pauls describes the commotion and chaos which reigned on the day of his accreditation in Jerusalem in a dispatch.